This morning’s lunar eclipse — which produced a coppery-red effect known as a “blood moon” — brought out skygazers of all kinds. 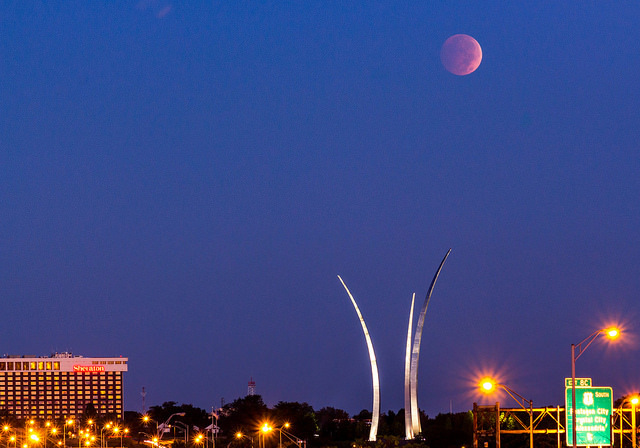 Among them was pilot, former Air Force contractor, and amateur photographer Joseph Gruber, who snapped this outstanding photo of the blood moon hovering over the Air Force Memorial. Gruber, who is also a first lieutenant with the Civil Air Patrol, said he was trying to find some high ground to snap a good shot of the eclipse in the Crystal City, Va., area where he lives. He realized Long Bridge Park, on the Potomac River, would provide a great view of the eclipse lined up with the Air Force Memorial. He headed there with his Canon T5i, and snapped the shot that is now spreading across social media. In a Twitter exchange this morning, Gruber told me he’s “not a pro photographer by any means but learning.” But judging from this shot, it’s clear he’s got a knack for dramatic framing. Thanks to him for letting us use his picture.